Citrus Connection has something to offer everyone in our area, whether you ride or not. The fact is that an affordable, working mass transportation system is important to local commerce, life and progress. It gets people to work, it makes our streets cleaner and safer, it saves valuable resources—and all of that adds up to a boost in our area’s quality of life. So whether you’re riding the city bus, using our paratransit service or just realizing the value of public transit to your community, Citrus Connection is part of your life. Service is currently provided six (6) days a week with Route 30 in Winter Haven now running Sundays as well. 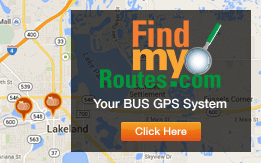 Bus routes will take you all around Lakeland, to Winter Haven, Bartow, Auburndale, Haines City, etc. By clicking the West and East County Routes tabs you will find PDF’s of each route providing specific locations and time points. You can print what you need before you leave the house or you can use our QR code with your smart phone to go to FindMyRoutes.com and look up the closest bus stop to your location.